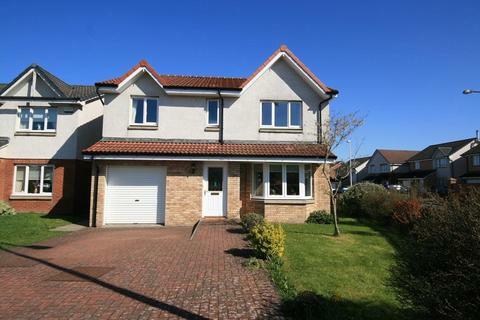 An excellent family home is offered from this immaculate and freshly decorated detached villa, that is set within attractive gardens and a highly sought after area. The accommodation is bright and well proportioned and has been maintained to a high standard. 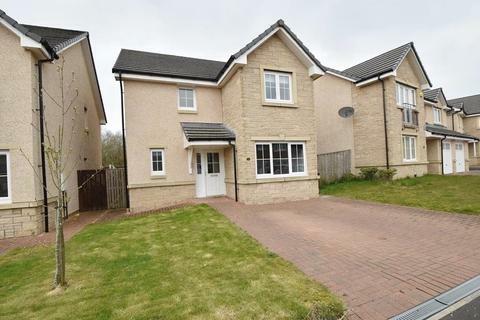 Comprises entrance vestibule, spacious living room, open plan dining room, well equipped fitted kitchen, utility room and W.C. On the upper floor, there are four bedrooms, three with built-in wardrobes and master with en-suite. Family bathroom. Further benefits include modern gas central heating, double glazing, alarm system and integral single garage. To the rear, there is a large fully enclosed garden with sunny position and the shed is included. Open plan lawn and borders to front. Monoblock paved driveway. The location has easy access to nearby rail station, supermarket, schools and the town centre amenities. There is also swift access for commuting via the A89 and major motorway networks. Flexible entry is available and early viewing is highly advised. Property reference nkSKCNwXYoE. The information displayed about this property comprises a property advertisement. OnTheMarket.com makes no warranty as to the accuracy or completeness of the advertisement or any linked or associated information, and OnTheMarket.com has no control over the content. This property advertisement does not constitute property particulars. The information is provided and maintained by Caesar & Howie - Bathgate. Please contact the selling agent directly to obtain any information which may be available under the terms of The Energy Performance of Buildings (Certificates and Inspections) (England and Wales) Regulations 2007 or the Home Report if in relation to a residential property in Scotland.